Prime Minister Manmohan Singh today announced a probe into the violence in Assam and said those found guilty of instigating it would be punished. He promised to do everything possible to bring back normalcy to the life of �hundreds of thousands� of violence-displaced people. On November 19, 2009, senior superintendent of police (SSP), VB, Patiala range, Shiv Kumar Sharma (now retired) asked revenue patwari Mohan Singh Bhedpur for a revenue record of his land in Fatehgarh Sahib�s Roorki village. 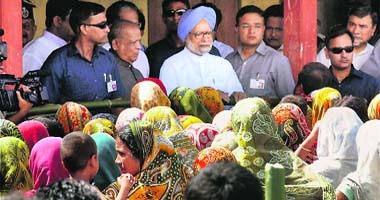 Mohan Singh delivered a copy of the record to the officer and asked for the government fee of Rs 20. That�s when all hell broke loose. Youthful Cabinet on the cards? Nehru-Gandhi scion Rahul Gandhi�s probable entry into the government is expected to see the promotion of several junior ministers when Prime Minister Manmohan Singh undertakes a reshuffle of his Cabinet. Nehru-Gandhi scion Rahul Gandhi�s probable entry into the government is expected to see the promotion of several junior ministers when Prime Minister Manmohan Singh undertakes a reshuffle of his Cabinet. The revamp of the Council of Ministers was earlier said to take place after the Presidential election and before the Monsoon session of Parliament commencing on August 8, but the exercise is learnt to have been put off till September. bid to disrupt Independence Day? Barely 17 days ahead of Independence Day, the BSF has detected a tunnel being dug 25 feet below the ground along the Indo-Pak border near Chalyari border outpost in Samba sector thereby foiling a possible plan of the �enemy� to cause disruptions on August 15. The tunnel, which probably started from Pakistani side, was detected 500 yards well within the Indian Territory. The BSF mans 192-km international border.